We have started our unit on pollination, flowers and bats this week. Here is a little craft we made to go along with our unit study. This would be a great Mothers Day gift (so dads gather the kids and get out the craft supplies before Sunday). Draw a ring 2 inches from the edge of tube. Repeat on other end. Then draw lines every 1/2 inch for kids to cut. My kids didn't do a very good job of using the lines. Snip along each line to make petals. Fold petals back to create flower. Paint flower and let it dry. The tempura painters were great for this craft and Gwyn had a fun time creating a pretty pattern. Glue two green popsicle sticks together then push them through the one end of the flowers center until it touches the other end. I added a little bit of hot glue to make sure it stayed secure. 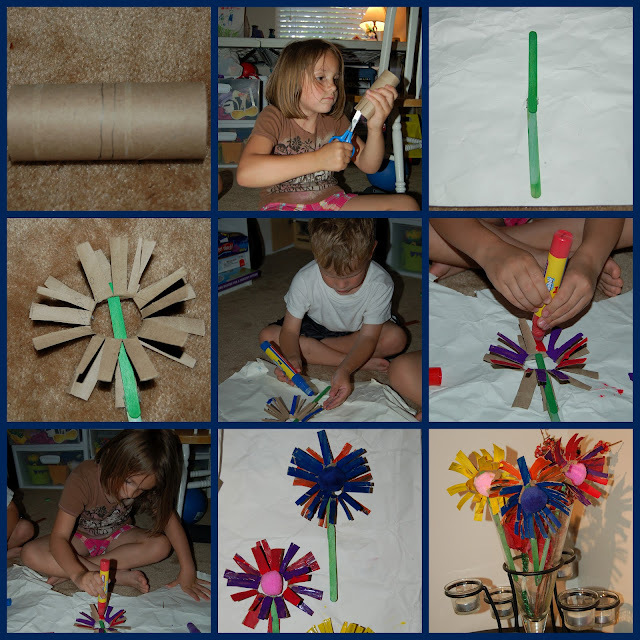 Have the kids pick out their favorite color pom pom and glue it to the popsicle stick in the center of the flower. *Disclaimer - Rose Art supplies from Mega Brand supplies us with lots of wonderful products in return for honest review and craft project how to's. I was not compensated for my review and all opinions are our own! Many of the links found on my side bars and in my blog posts are affiliate links. As a result, I might get paid money and I will most likely spend the money on homeschool supplies.